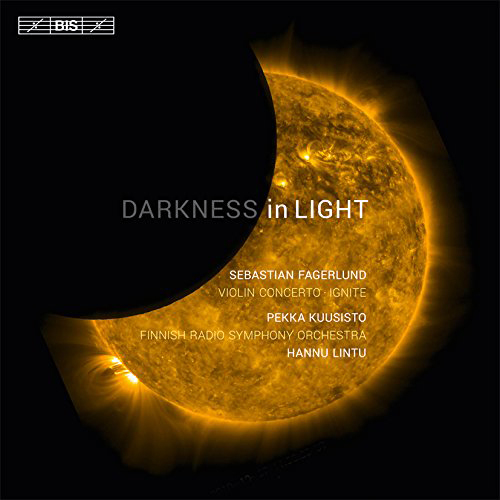 It says the violin concerto Darkness in Light “inhabits the zone between dream and reality” and is partly inspired by the literature of Haruki Murakami. It probably won’t surprise you to learn that the latter’s work is “marked by a Kafkaesque rendition of the recurrent themes of alienation and loneliness”. So this is intellectual stuff, but we have enjoyed it. It’s meaty and interesting, and it demands the highest standards from the violin player. It opens with the impression of a dark pit, the tuba, bass clarinet and timpani making a stormy sound, into which the violin appears like a shaft of light. The rest of the piece is the violin fighting with and flying around the oppressive presence of the black pit. The sleeve notes say that the feel of a zen garden comes in, a peaceful section part way through. The second piece starts off with the impression of a rocket firing into the heavens; the work is reminiscent of an experimental Disney cartoon along the lines of Fantasia, the first movement showing a character trying to escape the clutches of evil musical notes, the second with the character fired into a fifties vision of space, with Sputnik-like crafts going beep beep a lot. The movement here is much slower, and instead of dancing around the music, the violin slowly drifts. The final movement returns to earth and gets more dramatic, the orchestra finally cornering the violin, ending with a final, united note: the orchestra has either subsumed the violin or the plucky violin has taken control of the orchestra. It’s a sweet note, though, so hopefully a happy ending. The longer piece on here Ignite is in similar vein, and it opens in space, though it’s the space of Holst, and rather grander than the low orbit of Darkness in Lights battling violin. It all ends in a black hole. Fagerlund seems to have transferred the idea of particles colliding to create matter to making music, with musical ideas colliding to create something new. Out now on BIS (BIS2093). It’s a SACD for you audio buffs.